The Relyence Dashboard is one of the highlights of the Relyence tool suite. 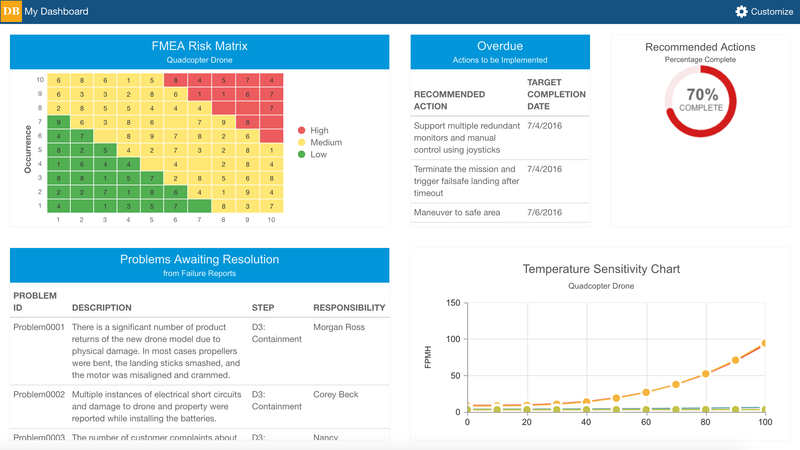 Providing insight into all your reliability and quality metrics at a glance, the Relyence Dashboards enable you to keep an eye on your system at a high level to monitor any and all aspects you deem critical. Importantly, Relyence Dashboards allow you to act proactively to issues before they are out of control. A key advantage of the Relyence Dashboard is the ability to turn insight into action. Relyence comes complete with a set of example dashboards that are built with the most common set of widgets used across the Relyence modules. However, Relyence Dashboards are completely customizable, so you can create a dashboard to meet your needs. Additionally, there are features built into the Relyence Dashboard that make it an impressive platform for helping to attain and maintain your reliability and quality objectives. This article will review 5 Top Tips for maximizing the use and effectiveness of the Relyence Dashboards. 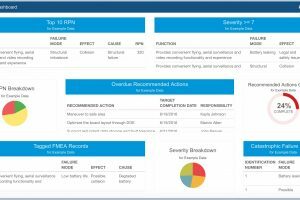 Relyence offers a number of pre-built dashboards for your use, including the FMEA, FRACAS, Fault Tree, Reliability Prediction, RBD, and All Modules Dashboards. The module-based examples include the most frequently used widgets for the specific module, and the All Modules Dashboard encompasses a useful set of widgets that spans the Relyence modules. You can choose to use these dashboards as is and simply replace the “Sample Data” setting to use your Analysis data. The most effective use of the Example Dashboards is to use them as a starting point to create your own dashboard. You can create a new Relyence Dashboard based on an existing Example Dashboard. Once created, you can then click the Customize button to go into the Relyence Dashboard Designer and configure your dashboard. The Designer brings you to the dashboard canvas where you can add and remove widgets, move widgets around, and change widths and heights. You can also create a new, empty dashboard and start from scratch to build your own dashboard layout. Relyence Dashboard Designer uses a drag-and-drop interface, so customization is quick and easy. Another advantage of the Relyence Dashboard feature is the ability to create as many different dashboards as you would like. For example, you may want a dashboard suited for optimal viewing on your mobile device and a different dashboard better suited for viewing on your desktop. Check out the customize features to create a dashboard or several dashboards to optimize your view in to your reliability metrics. 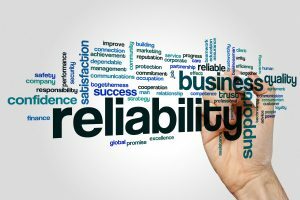 The Relyence Dashboards provide a high level overview of your reliability and quality metrics across any and all of your Relyence modules. The function of the Relyence Dashboard is to aggregate the data from your Analyses and present that information in a concise, clear, visual format. However, in some cases you may want to take a look at the data behind the scenes. Relyence Dashboard includes the useful drilldown feature that enables you to delve into the details. To use drilldown, simply click on the specific data you want to review in detail. For example, if you have the Top 10 RPN widget on your FMEA Dashboard, click on any of the 10 line items and you will automatically be taken to the specific item in the FMEA Worksheet that this item pertains to. To return, simply click the Back to Dashboard link the Sidebar menu. In some cases, you may see a widget with double-drilldown. For example, the DFMEA Test Plan Status widget shows a pie chart of passed and failed test plans in your DVP&R (Design Verification Plan and Report) Worksheet. Clicking on a piece of the pie chart will bring up a list of the particular test plans contributing to the particular status. From this list, you can then click on a specific line item to be taken to the test plan in your DVP&R Worksheet. The Relyence Dashboard not only provides an informative high-level overview of your Analysis data, but also supports drilldown for insight into the details as well. A significant advantage of the Relyence Dashboard is that it gathers Analysis data from a number of different sources and presents it in an organized overview for at-a-glance insight. It’s the best way to keep the metrics that are most critical at the forefront and proactively address issues while they can be easily managed. It’s the essential mission of the Relyence Dashboard: enabling you to turn insight into action. 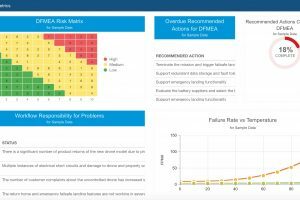 A single dashboard can combine metrics from any and all modules: FMEA, FRACAS, Fault Tree, Reliability Prediction, and RBD. You can have separate dashboards if you prefer, but Relyence allows you to combine measures from all modules for a single overview. Especially handy for managers or team leaders, the cross-module support of the Relyence Dashboard provides a great way to keep track of activities across the whole team. Additionally, the Relyence Dashboard supports cross-analysis capabilities. This means that you can combine metrics from any number of Analyses into one widget. For example, you may have several FMEA teams working on various projects, or on various parts of the same project, in different Relyence Analyses. In this case, the Top 10 RPN widget can pull data all your Analyses so that you see the items with the highest risks across all your projects in a single place. Similarly, using the Problems Pending Approval widget, you can include Problems across all your Analyses, or even a subset of your Analyses, so that you can review all FRACAS Problems that are awaiting team member approval in one place. Take advantage of the cross-module and cross-analysis features to leverage the full power of the Relyence Dashboard! Another very useful feature of the Relyence Dashboard is the ability to designate “my responsibilities” in various widgets. This enables you to view the items that are assigned to you at a glance. When in Customize mode, simply select the items “that I am responsible for” checkbox. All items in the widget that are assigned to you will automatically be displayed. For example, you can view all Problems in Relyence FRACAS that you are responsible for. The “I am responsible” setting in the Relyence Dashboard is smart enough to know who is actually signed in and viewing the dashboard. So for example, you can create one dashboard and select the “I am responsible” setting for your widgets, and any member of your team who signs in and accesses this dashboard will see their assignments (not yours!). This feature enables your entire team to more effectively keep track of tasks and more efficiently manage their time. The last tip is to use the Relyence Dashboard to keep track of all-important pending and overdue due dates. This critical information can sometimes be buried in a large Analysis with a lot of data, so using the dashboard to filter this vital information can be greatly beneficial to keeping your tasks on track. For tasks that have due dates attached, there is a Relyence “overdue” widget available. Your goal, of course, is to keep that overdue list clear, but you’ll see an overdue item pop up on your dashboard for quick highlighting! Workflow and approval tasks have various widgets enabling you to track due dates. In Relyence FRACAS, you can include widgets for Incidents Pending Approval, Problems Pending Approval, and Workflow Responsibility. These widgets all include due date information to enable you to keep up-to-date on your assignments. Combining Tips 4 and 5 can help you keep an eye on all your responsibilities in a single view. At Relyence, our mission is to build not only the most capable tools, but also the most technologically advanced and well-crafted applications available. We rely on our expertise to build the tools reliability experts expect, and couple that with a design elegance and utility that makes our tool suite stand out. The Relyence Dashboard showcases the Relyence difference: elegant, intuitive design backed up with reliability expertise that makes your job easier. Relyence offers a free fully functional trial of our complete tool suite. Register today to check out the Relyence Dashboard capabilities, or any of our reliability engineering applications. Feel free to contact us, or call today at 724-832-1900 to speak to us directly about your requirements or to schedule a free webinar.